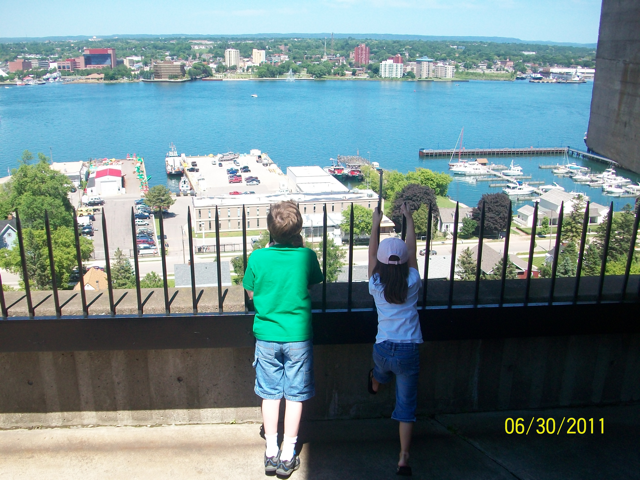 Today is our last day in Sault Ste Marie. We still had our tickets to the Tower of History, so we went over there, and then we headed out of town to get a few miles under our belts. Now that we are finally heading south, we are kind of anxious to get on with it, but still taking it all in along the way. We also needed to do some grocery shopping, so we got that out of the way early in the day. The Tower of History was initially built as a monument dedicated to the missionaries that worked in the area over the years. Now it houses historical information from the area, along with information about the missionaries. The first floor houses displays about the Native Americans from the area, and how some tribes blended well with the French and English explorers, and how some, such as the Iroquois, were a brutal and aggressive tribe that didn't get along with anyone, even other tribes. It was in the interest of the explorers and settlers to get along with the Native Americans to further trade in the Great Lakes areas. 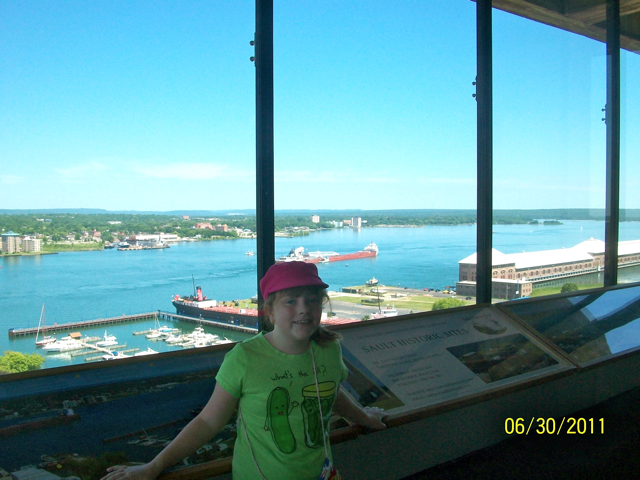 The history we learned was interesting, but by far the best part of the Tower of History is the view. It was a clear, sunny day and we could see all around us for miles. Awesome! 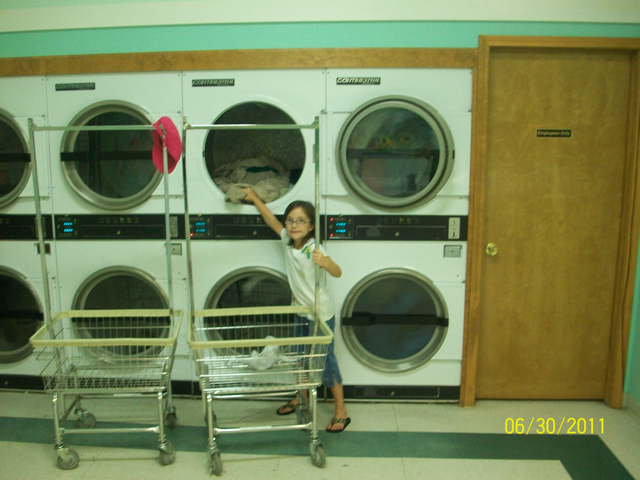 The last event of the day was a trip to the laundromat. Chrissy loved it! I'm not sure why, but she did. She was all about helping, too. We had SIX loads to do! I'm thankful we could start them all at once. We don't normally have that many, but it had been a while since we'd made the time to do laundry. We have a washer/dryer combo in the RV, but it only does really small loads at a time, so we just use it for small things from time to time. But with all five of us helping, it went by really fast. In less than two hours we had all of it washed, dried, and put away. Teamwork!! Today started out kind of rough. Jim really isn't feeling well. I think it's a combination of the frigid temperatures and rain, maybe with a hint of kidney stones. The rain is really hard on his joints. So for the beginning of the day, we just hung out in the RV. 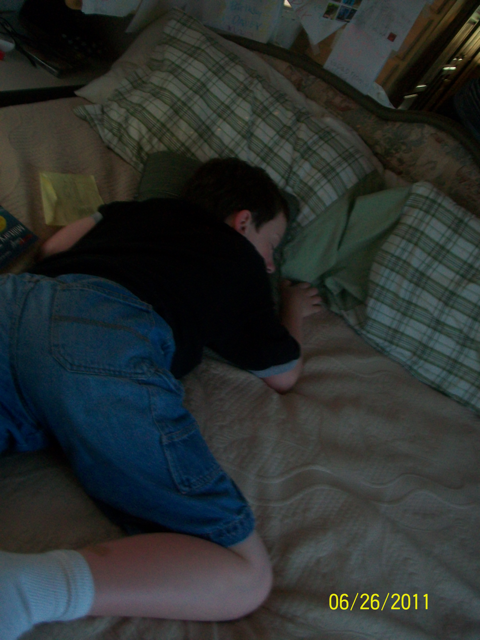 Jim really needed to rest, and although he really didn't want to, he acknowledged that was what was best. So the kids and I watched movies, played online, cleaned up a bit, and relaxed. I spent time taking care of my sweet hubby, of course! Late in the afternoon, Jim started feeling a little stronger, and really wanted to get out of the RV and get a change of scenery. 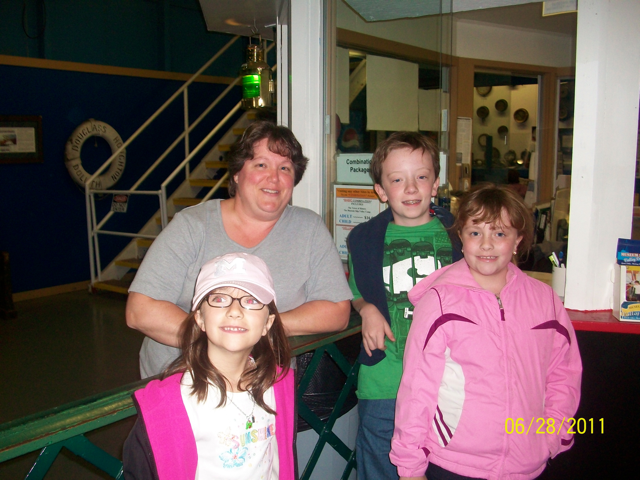 So we all got ready to go and headed for the International Bridge to Canada! This was no easy task with all of the road construction, but nevertheless, we did make it. 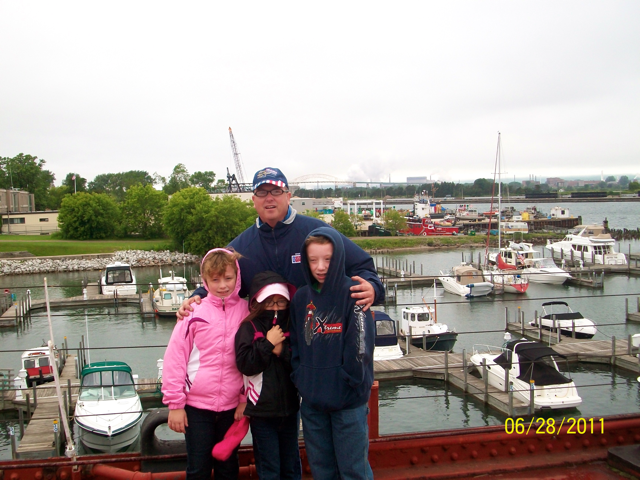 The kids were really excited, but they worried about leaving Sam in 'another country' while we were in Canada. I told them that even though it was 'another country,' in reality we were only about thirty minutes away from him, and he would be okay. 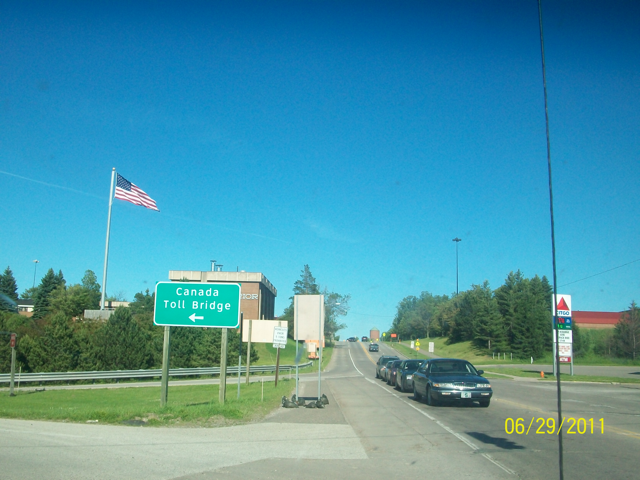 Once we made it through the construction zones and onto the bridge, the toll plaza was our first stop. It was a $3 toll, which wasn't bad, especially compared to the other tolls we've paid along the way. 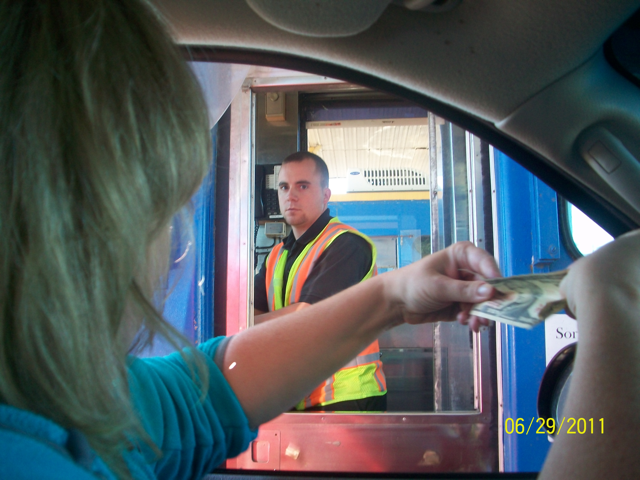 The toll booth operator was friendly and had a great personality. 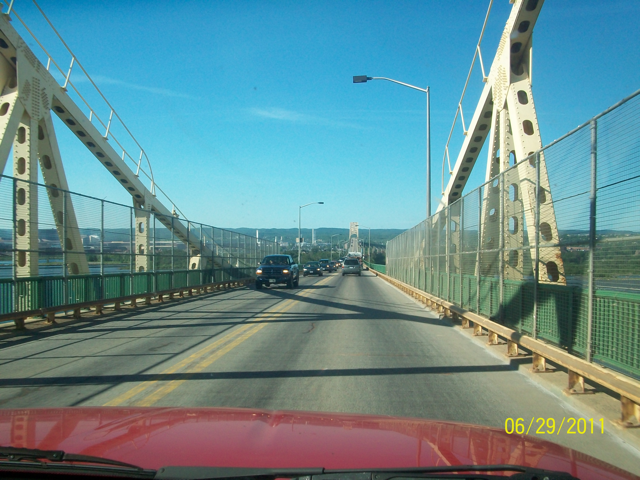 The drive over the International Bridge was great. 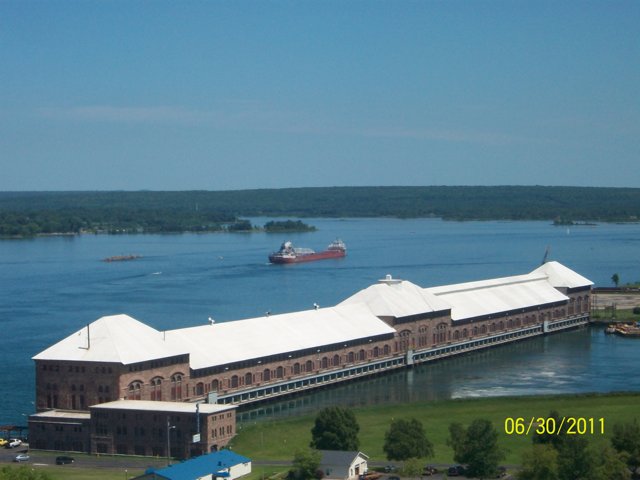 Breathtaking views of the St. Mary's River and both countries, although the Soo cities are fairly industrialized at the river. 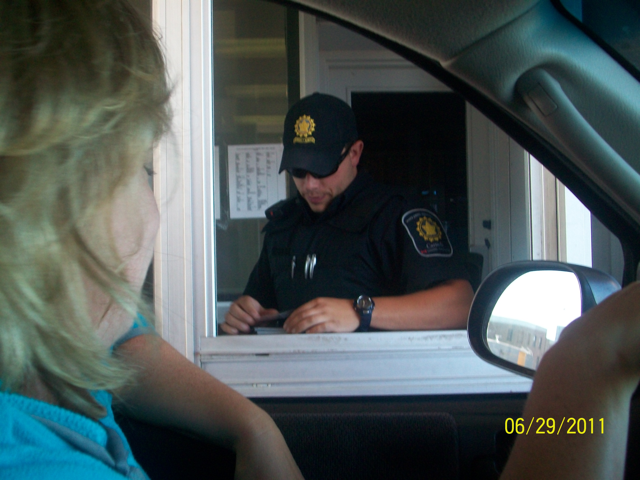 It was kind of exciting as we were driving close to Canadian customs. We drove up, and the customs agent made it clear we could NOT take a picture of him, but that we were free to photograph anything else. He was completely serious, too. However, by the time he said that, Jim had already taken a picture of him without the flash. Jim and I always joke with each other, "What's your business in Canada?" It's a line from "That 70s Show." But really, the customs agent wanted to know. Why were we there, where were we going, who we were meeting, when were we leaving, where were we staying in Michigan, and various other questions. I was kind of surprised at how serious and thorough he really was. Once his questioning was done, he was friendly and gave us some recommendations for great restaurants. 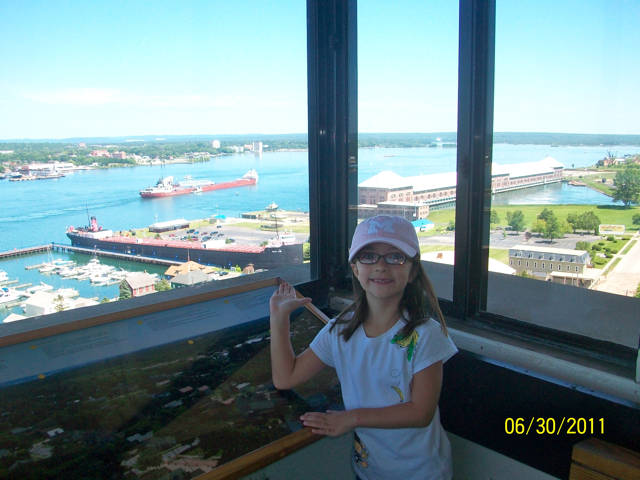 Our first stop in Sault Ste Marie, Ontario, was the visitor's center. They had great maps and knew where to send us for Canadian souvenirs. We also decided to go ahead and exchange our US dollars to Canadian dollars. 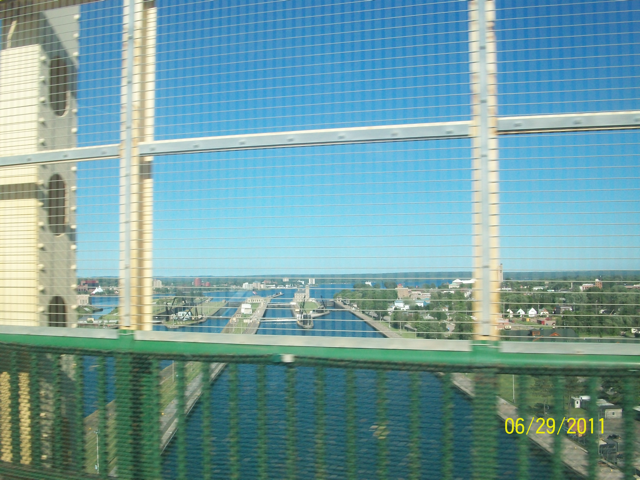 We headed further into the city of Sault Ste Marie. 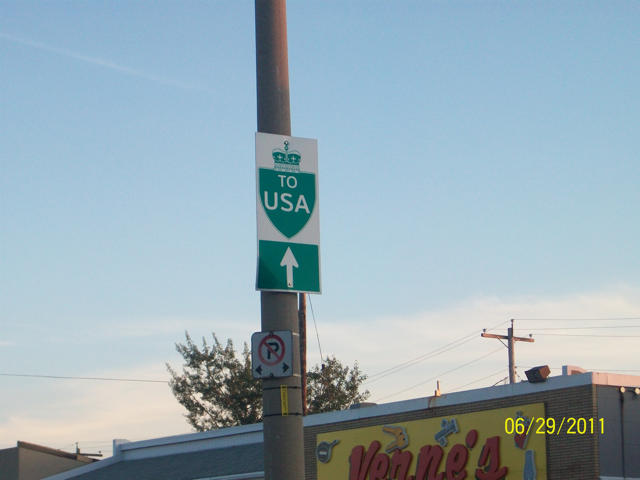 It was really neat to see the Canadian versions of things we have here in the US. All of the fast food restaurant signs had a Canadian maple leaf added to them. Center was spelled Centre. Even McDonald's cups - instead of English and Spanish, the writing was in English and French. Kilometers instead of miles. Little things fascinated us. It's okay, we don't get out much (kidding!). 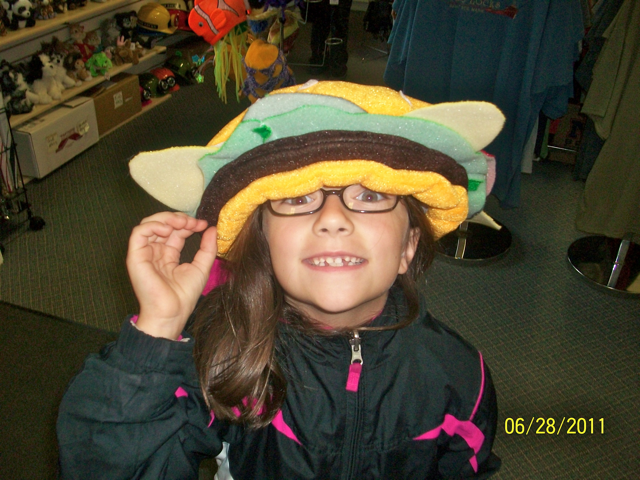 We went to a little shopping center called Frontier Village. There were several stores and restaurants here. The Totem Pole and The Trading Post were a couple of the stores, and Frenchie's Fries and CJ's were restaurants. The Totem Pole had very earthy, woodsy kind of things. They had MANY animal pelts in there. Some were made into things and some were just wall or floor decorations. There was a fox that Rachael and I thought looked like a purse. There was a totally creepy wolf, too. We didn't stay in there too long. We ate a CJ's. 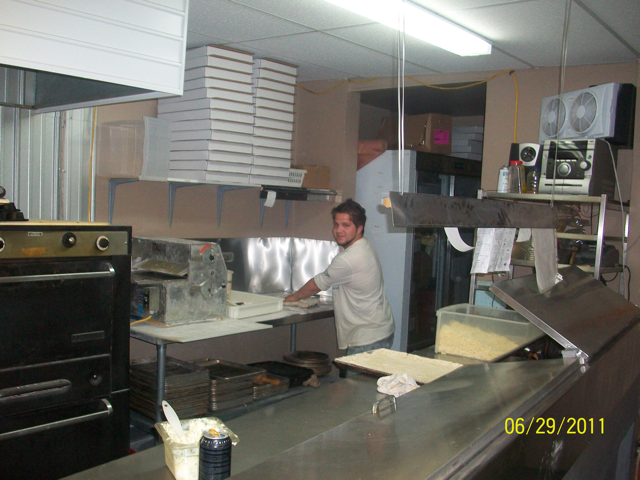 They had freshly made pizzas, subs, burgers, and shrimp, so this made everyone happy. The two employees here were very friendly. They told us they actually don't get many Americans in their restaurant, usually just locals. The food was fabulous! This way to the USA! 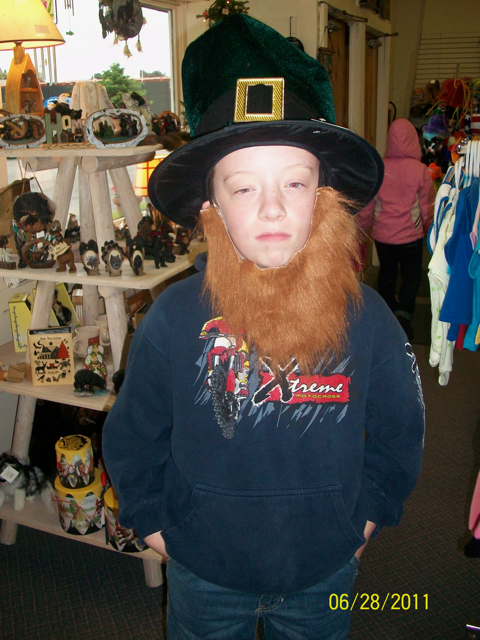 After some souvenir shopping, we were ready to head back into Michigan. I must say, the signs were very clear and helpful in navigating the one-way streets back to the bridge. It was nice to see the signs that said "To USA" with an arrow. We know we weren't all that far, but it was still great to see it. 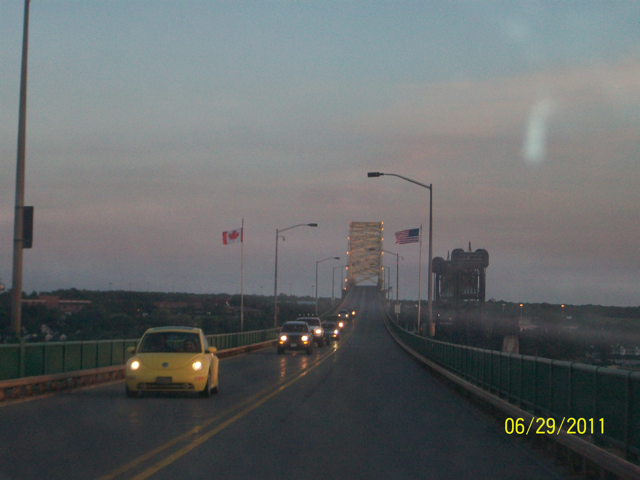 We got onto the bridge towards the USA. It was just as pretty at dusk as it had been earlier, and at this time of day, the bridge was lit up, too. The line at US customs was longer than the Canadian one had been. 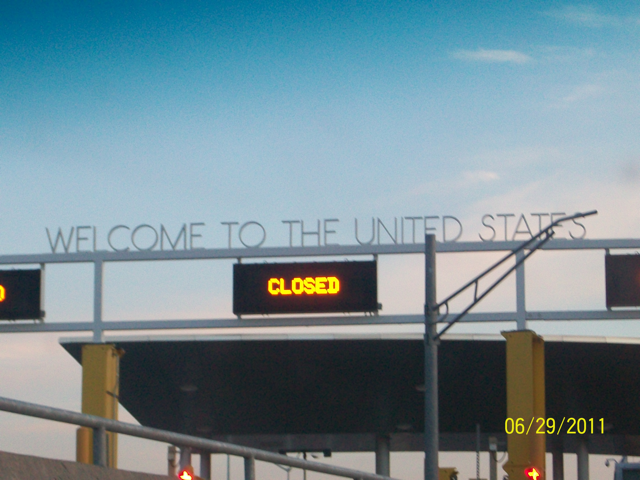 By this point, I wasn't AS surprised, but the US border agent was just as thorough, if not more so, in asking what our business in the US was, and what had we been doing in Canada. If I gave a simple answer, he wanted more details. It wasn't a big deal, though, and we were done in no time. Funny how it says "Closed"
It was an adventure for us, especially the kids. They acted SO relieved to be in their home country again! You would have thought we had been around the world! But their excitement and awe made it all the more fun. There are a TON of pictures in the Photo Gallery this time (well, more than usual). We took progressive pictures on the bridge in both directions. 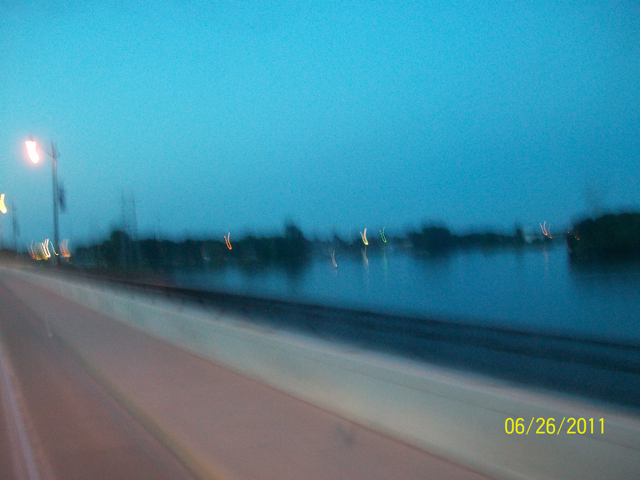 My dad seems to be very interested in us driving across bridges, so we took a lot of pictures for him. 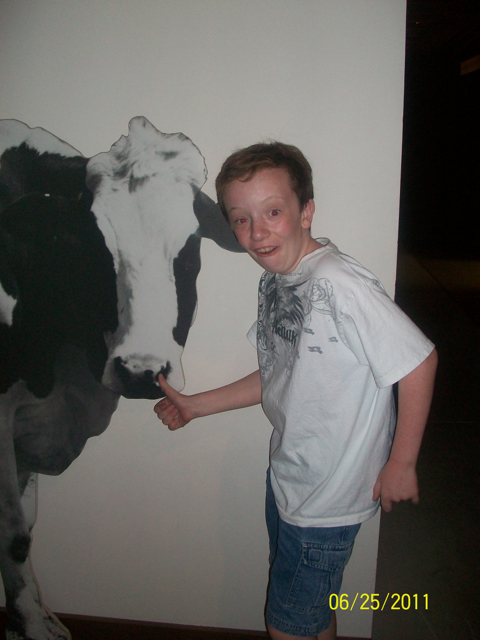 Also, you'll notice Michael's nose picking pictures in there. He didn't really have a chance for anything yesterday, so he made up for it today. 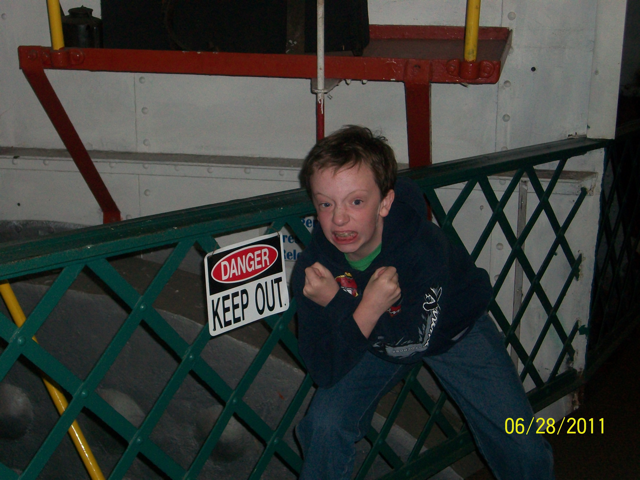 Silly kid! We hope you are enjoying following our travels! We certainly are! 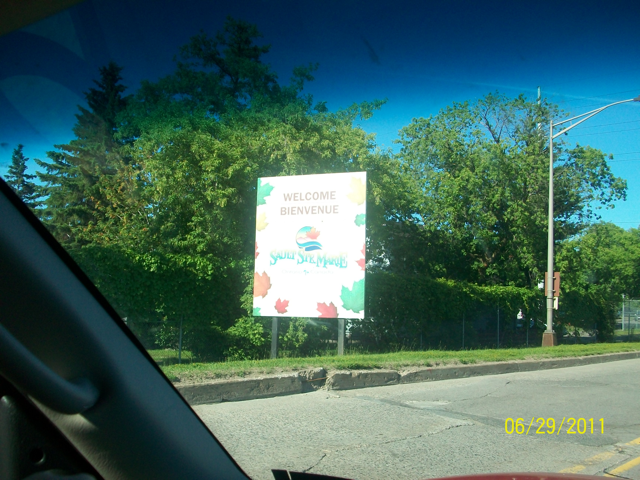 Today we arrived in Sault Saint Marie, Michigan. This city sits on the northeastern edge of the upper peninsula of Michigan. 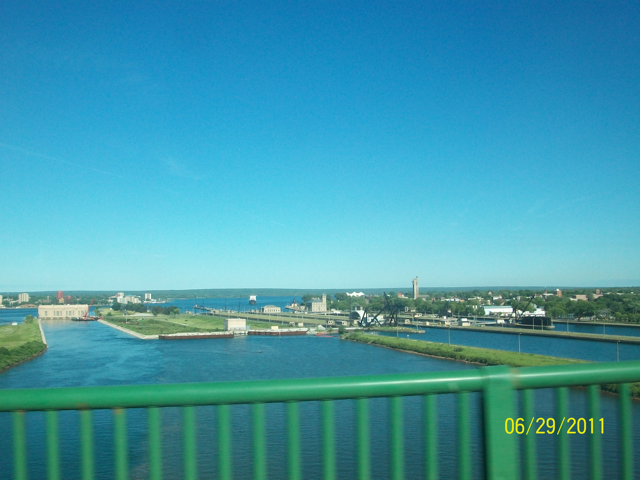 Just across the International Bridge is Sault Saint Marie, Ontario, Canada. The word Sault, pronounced "soo," is French for 'falls' or 'waterfalls', for those of you who may have been wondering. Sault Ste Marie is famous for the locks, connecting Lake Superior with Lake Huron via the St. Mary's River. On this portion of the St. Mary's River is an area of rapids, and there is a twenty-one foot drop in elevation. Back in the early shipping days, they would put ships on rollers and 'portage' them around the rapids and back into water. Most of the time, this took fourteen weeks! The very first canal built only took one year to complete - a very smart investment of time and resources, if you ask me! 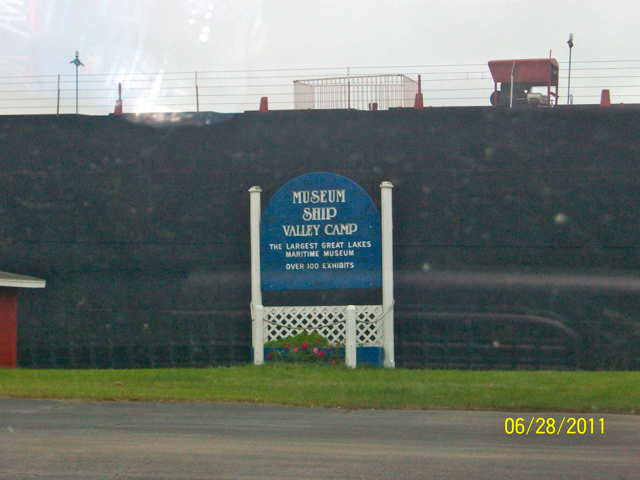 Our first stop in the "Soo" was the Museum Ship Valley Camp. The Valley Camp is a cargo steamship that was built in 1917 and used until 1968. Now a registered historic site, visitors can walk all through the steamship, viewing all kinds of maritime exhibits and history. Given the harsh winters in Michigan, the only time road construction can be done is in the summertime. And where was the road construction? 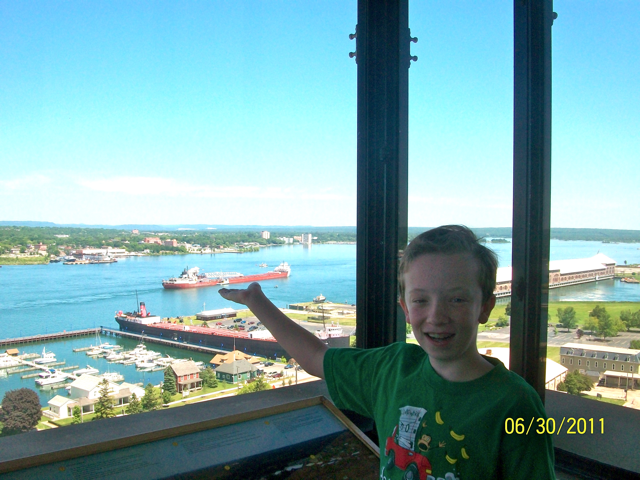 Right in front of ALL of the main attractions in Sault Ste Marie. We got stuck in an endless maze of road closures. We finally called the front desk of the Valley Camp, and the helpful woman, Lynn, finally got us there, after a few more wrong turns! We were very thankful for her help! 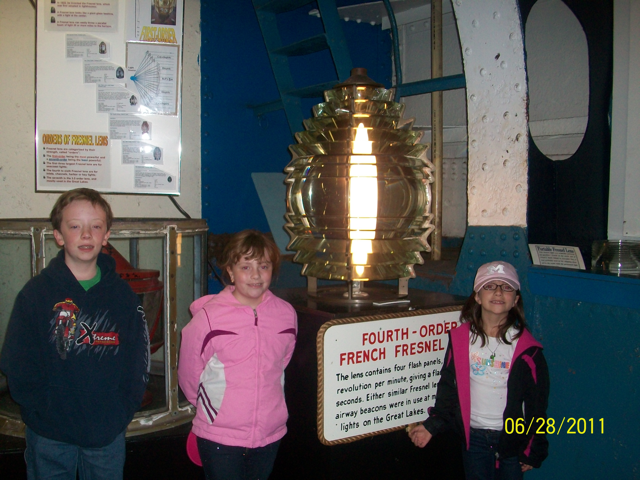 Some of the exhibits on the Valley Camp include lighthouse lights that were actually used in local lighthouses. We learned a lot about the special lenses that were used to make the lights brighter and shine further. 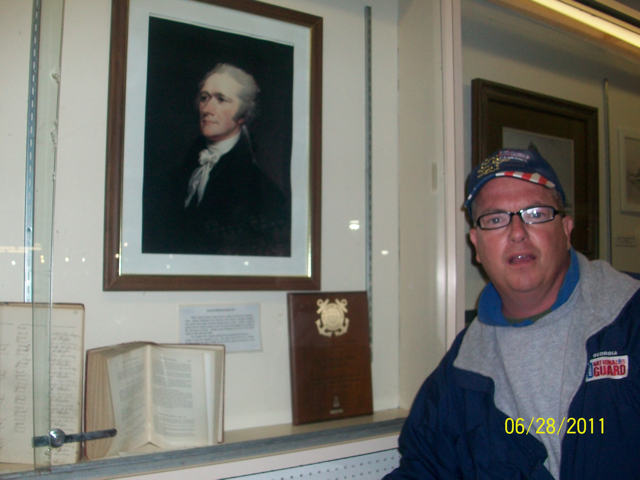 We also found it interesting to learn that Alexander Hamilton, the nation's first Secretary of the Treasury, is considered the father of the Coast Guard. You can learn more about that on our History Fun page. 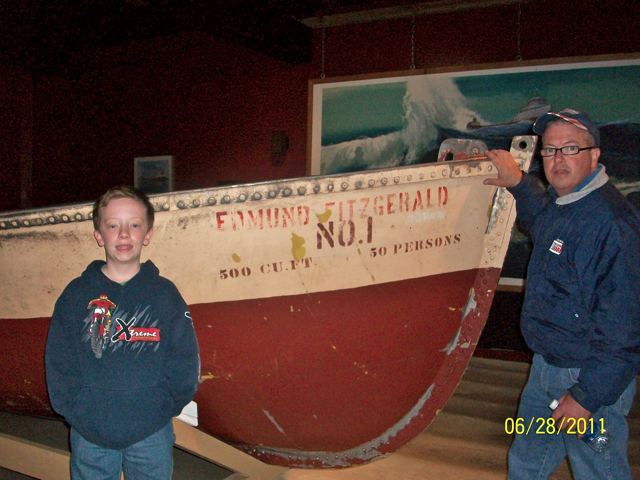 The Valley Camp is also home to the wreckage of the Edmund Fitzgerald, probably the most famous shipwreck of modern times. You may be familiar with the Gordon Lightfoot song about the shipwreck (It was before my time :) ). There are three floors of exhibits, plus you can go topside. 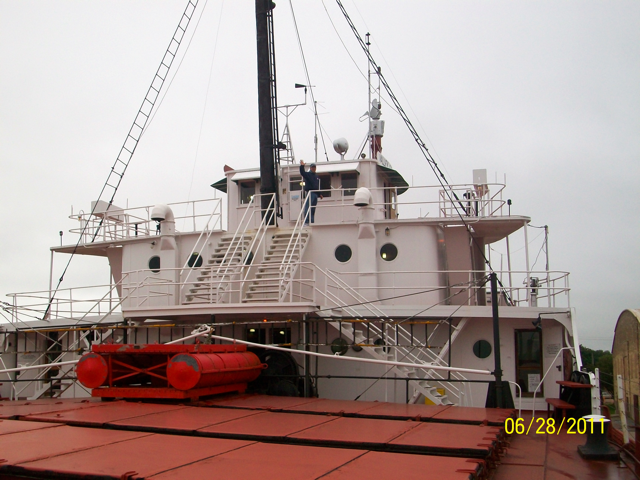 We thought you really get a sense of how big the ship is in two areas: topside and in the main cargo hold. It was really neat to see how the captain's wheel in the pilot house is connected to the engine room. They noted throughout the ship the parts that connect the two. 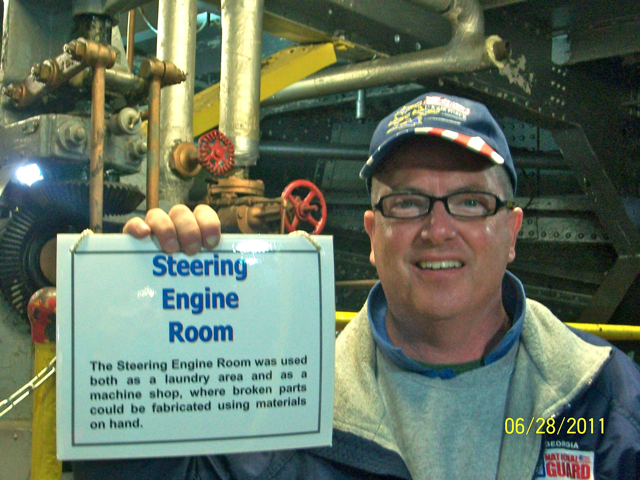 The engine room also had a machine shop that was used to manufacture replacement parts for the engine. We bought combination tickets to the Valley Camp and the Tower of History. Since it was so late in the day, we decided to save the Tower of History for another day. However, the Visitor's Center for the locks was open later, so we headed over there, but not before a quick visit to the Gift Shop. 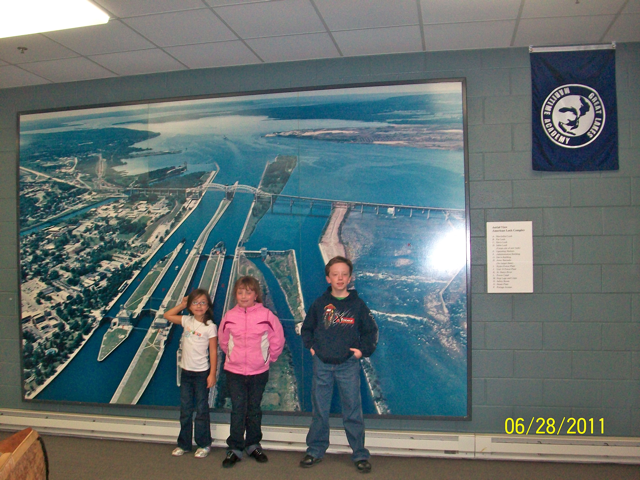 The Soo Locks are operated by the US Army Corps of Engineers, and they run twenty-four hours a day. The visitor's center is open from 9AM - 9PM, and visitors are provided with a phone number to call and get the latest schedule of ships passing through the locks. There is a nice, enclosed viewing platform for visitors to get a bird's eye view of the locks in operation. The center also has several documentary films playing throughout the day. They had an excellent explanation of the locks and how they work on display. 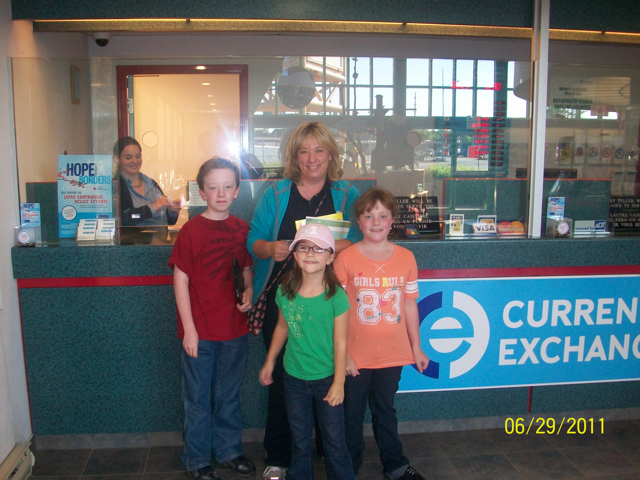 The kids totally understood by the time we were through. It was a busy but fun day. Tomorrow we plan to head into Canada! We got our passports months ago, and the kids are thrilled to use them. The bridge is almost three miles long, and quite impressive! It is worth noting our clothing in the pictures from today. The high was 48 degrees!! We were FREEZING! We had to go buy more jeans and sweatshirts to stay warm, as well as a pair of shoes for Rachael that weren't flip-flops. She was NOT happy about that! Well, once we got a good night's sleep and recovered from our deer incident, we were ready to explore Michigan's Upper Peninsula. For those of you that are 'outdoors' types - this is the place for you! This motorhome is as close to camping as I care to come. Just not my thing. 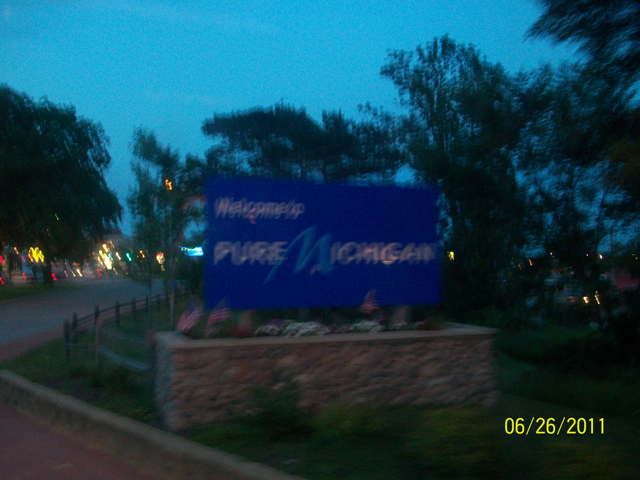 But I will say that this part of Michigan is absolutely beautiful, and seems hardly touched. There are miles of hiking trails and tons of available camping, from motorhomes to primitive sites. Visitor's Center. Lake Superior is in the background. 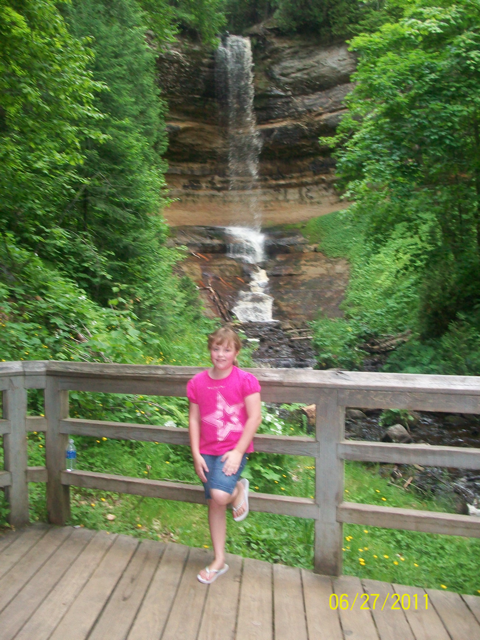 Munising is a little town on the edge of Lake Superior. You can take boat tours of Lake Superior which include the Pictured Rocks National Lakeshore. Pictured Rocks is a fabulous spot to tour or explore Lake Superior, and was recommended by some of our Michigan people on the "Tell Us What To See" page. There are also many water falls in the area. A quick stop at the Visitor's Center equipped us with what we needed to know: what was in the area and what did we want to try to see. 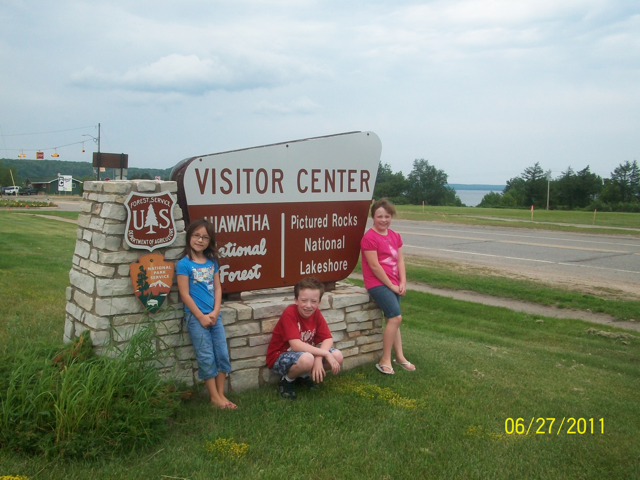 The Park Rangers at the Visitor's Center were super helpful and very knowledgeable. There were a lot of beaches along this portion of Lake Superior, but we didn't visit them for two reasons. One, they were only accessible by hiking - three miles minimum. Second, the water is around 44 degrees, and that's just wrong! 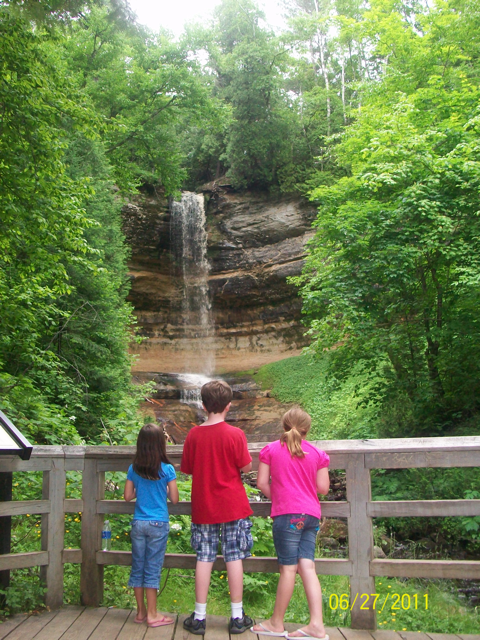 We chose to see the Munising Falls. 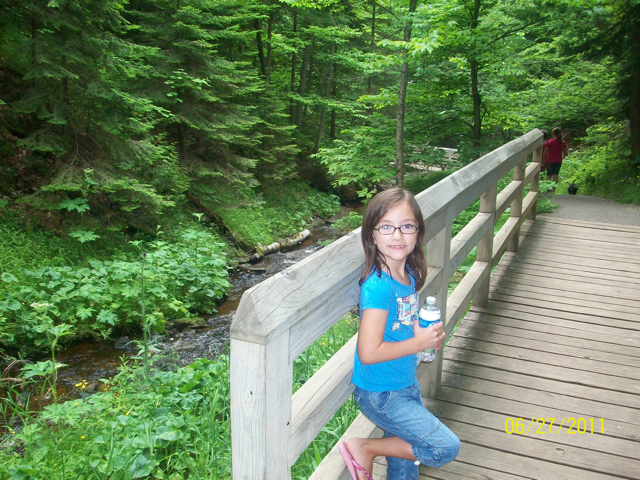 It was an easy hike - a must for us, for lots of reasons. The Park Ranger there was very friendly, too. Our only mistake was forgetting the bug spray!! Mosquitoes were everywhere. UGG! However, that aside, it was definitely worth the stop. There was one main path to the falls, and two side paths off from that. Those two paths led up to higher viewing points. The kids were very into it, so we took the falls in from all three points. 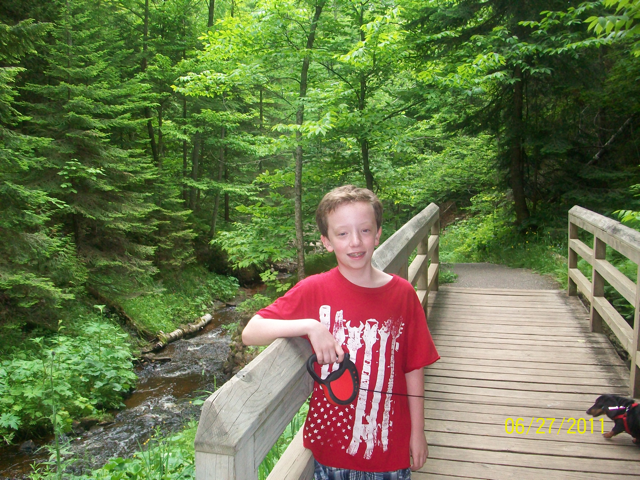 Sam (the dog) even held his own on this small hike. 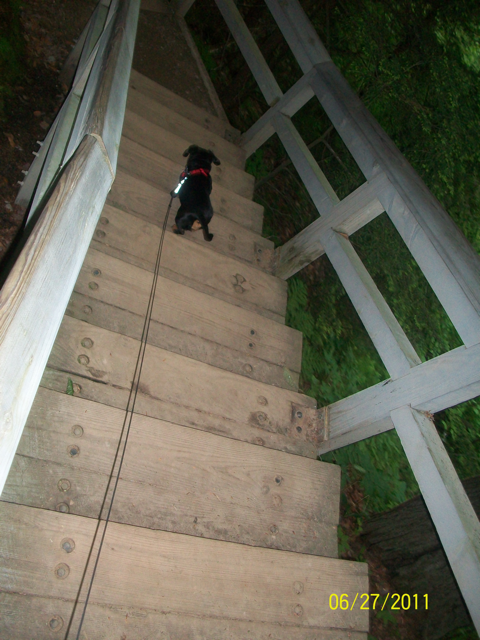 The steps of the path were wide and shallow, so he had no problem with them. He kept up and seemed to really enjoy it. I'm sure the vet will be thrilled, since he's on a 'diet.' Don't tell Sam, though. These stairs he can climb up and down! 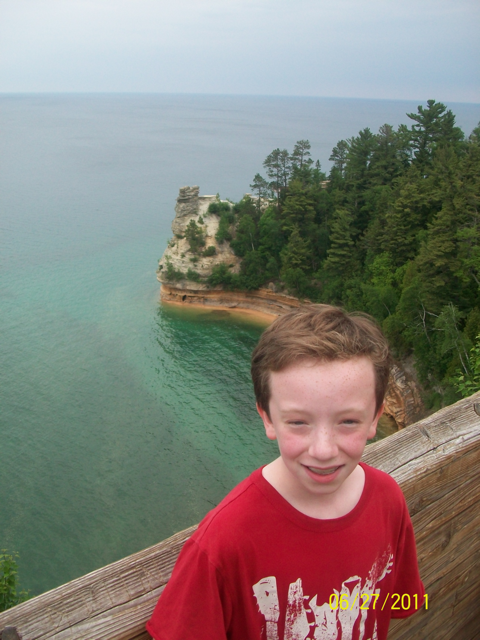 After Munising Falls, we headed over to Miner's Castle, which is supposed to have the best viewing point for the Pictured Rocks area. There is a little center there, but it was closed by the time we got to it. You can walk over to one edge where you have a fantastic view of Miner's Castle itself. 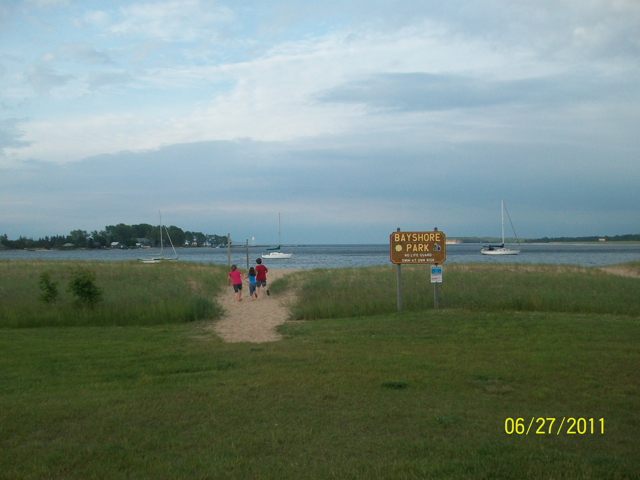 You can also see the Grand Island from this area, and vast waters of Lake Superior. In another area, the path leads right up to Miner's Castle and a view the Miner's Beach area. After Miner's Castle, we continued eastward to Grand Marais (pronounced muh-ray, in your best southern accent). This is another lakeside town, but much smaller. We were actually able to park the motorhome on the side of the road - it was a very wide road - and go to one of their parks that is right on Lake Superior. 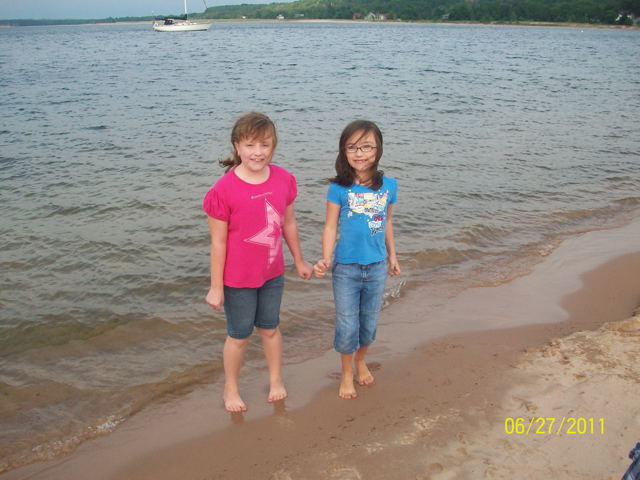 This is where we actually got to put our toes in the lake. They didn't stay there long! It was like putting your feet in ice water, and your toes come out as ice cubes. It was neat, though, to give the kids a different perspective on what other beaches are like. They've only seen the sugar-white beaches of Florida's Gulf Coast, and those of a few spots on the Atlantic beaches. While you couldn't get down and build sand castles, there were waves and a steady breeze. Seeing the boats anchored out in the bay was pretty cool, too. They are trying to smile in the cold water! 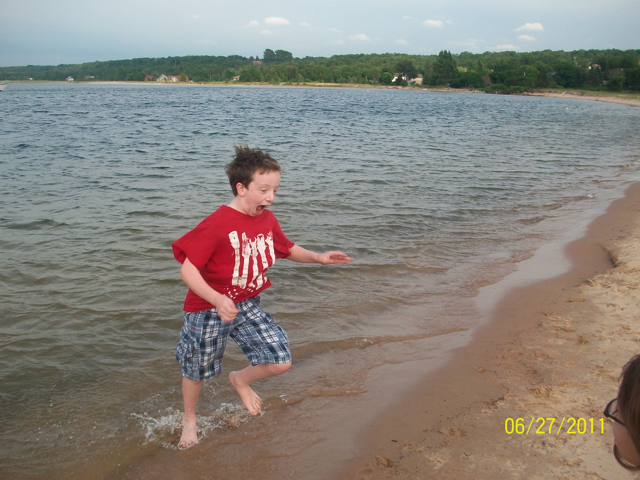 This is what Michael REALLY thought of the water! So these two Lake Superior towns made for a full day. We ended it with ice cream from a local shop. It was soooo good! Tomorrow it is on to Sault Ste Marie, Michigan. Hopefully we'll discover why Sault is pronounced "soo". Stay tuned! Today was an average day - I don't even have many pictures! We went to church this morning. We found a great non-denominational church in Appleton, Pathways Church. They had an early service, so that's the one we went to. If you are ever in Appleton, you can check them out HERE. After we had lunch, cleaned up the RV, Skyped with family and got ready to go, it was towards the end of the afternoon. 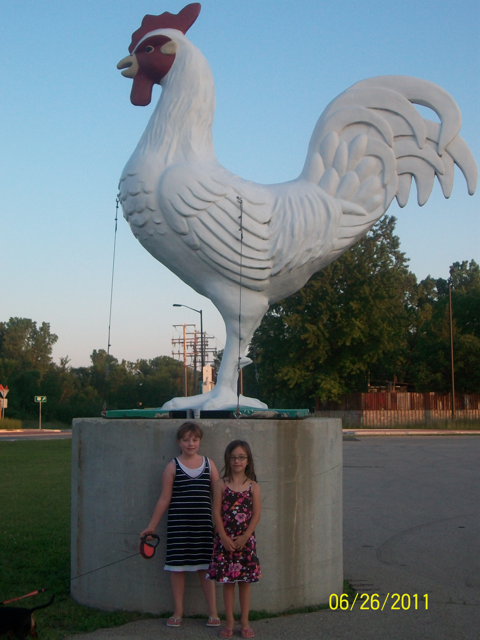 We pulled into the last town in Wisconsin, and over the border into Michigan, around 9:30PM. It wasn't a big deal because all of the streets were very well lit. I was driving, Rachael was in the passenger seat - buckled up, of course - Jim was sitting with Chrissy, and Michael was sound asleep in the bedroom. Rachael and I both saw it - a deer. There was nothing I could do but start to brake safely. The impact was huge! But between the RV and the deer, the RV most definitely won. There wasn't really much damage on our end. The door to the generator, which is in the front, was bent a little bit - as in it doesn't shut like it should, but it does shut. That's about it as far as damage. Can't say the same for the poor deer. We were all okay. Michael didn't even wake up. Sam, the dog, ran under my feet and wouldn't budge. It scared him more than anyone else, I think! We had to pick him up and move him to the back. 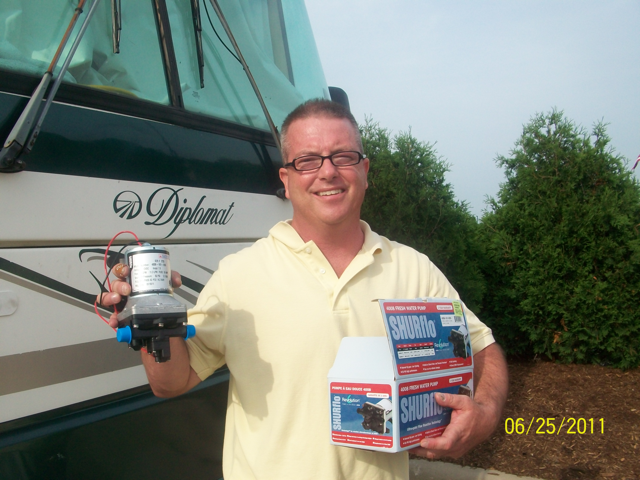 Once Jim and I checked everything out with the RV, we got back on the road. Thankfully we weren't too far from where we were stopping for the night because I was a little shaken. So while we don't have many pictures, it did turn out to be quite a day! Tune in tomorrow...we start touring the UP - Upper Peninsula! Today started with a problem. Well, really yesterday ended with this problem, and it just carried over into today. The short version is that the water pump, that pushes water into the plumbing system (not the engine) went out. Jim took a look at it and there was an electrical component that was old and fell out. This caused the pump to run all the time, so he figured out how to wire a switch inside the bathroom so that we could manually control it until we could get it fixed. This was all Friday night. Saturday morning, we found a camping supply store in Appleton. They carried a water pump like we needed. So with a quick 15 minute drive, we had the replacement part, although the price tag hurt a little. This was one of those moments when I was SO thankful that Jim is mechanically inclined. Who knows how much in labor we saved just because he could install it himself. Jim wrote in his blog about it, so feel free to read his thoughts. With this necessary repair completed, we still had a good bit of the afternoon left to see things in Appleton. 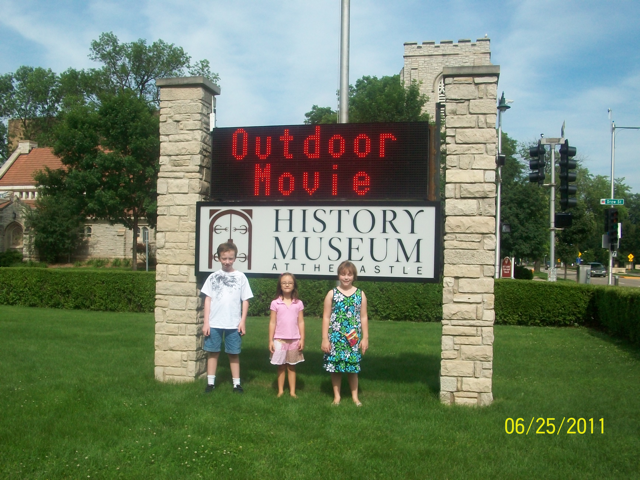 We went to the History Museum at the Castle. This museum is in an old Masonic temple. It truly looks like a castle - as I'm sure you can tell from the pictures. Truthfully, it was extremely CREEPY inside. I wish I could describe it, but it is difficult to put into words. I never said anything, but each of the kids said something separately about how it was "creeping them out." Creepiness aside, it was a great museum. 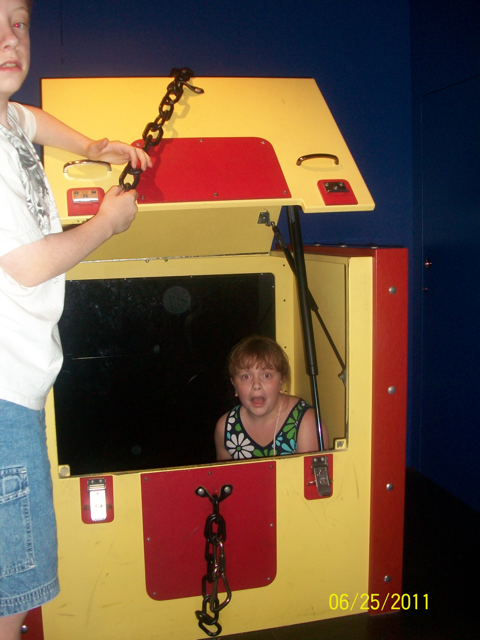 The entire third floor was a Harry Houdini exhibit. Houdini, born Ehrich Weiss, immigrated at a young age from Hungary with his parents to Appleton. His father was a rabbi, but was fired from the congregation. Who knew rabbis could be fired? Apparently, the story goes that he was just too 'Old World' for the growing city of Appleton and its Jewish residents. Rabbi Weiss could not easily find work and the family lived in poverty for quite a long time. They eventually moved to Milwaukee, and then to New York, in hopes of a better life. This exhibit has been widely criticized by the magic/illusion industry because it tells a lot of the secrets behind Houdini's 'magic.' He was know as a great escape artist, but this exhibit shows how he did even his most amazing stunts. It gave quite an insight to Houdini as a person, not just the performer. One great part of this floor allowed visitors to put on their own magic show. You could watch a short video, practice, and then perform your 'magic' trick for the audience. We had this whole area to ourselves, so Michael was the magician and Rachael and Chrissy were his helpers. We took a video of it, so I will try to post that. There are photos in the Photo Gallery that show the trick in a sequence of photos. 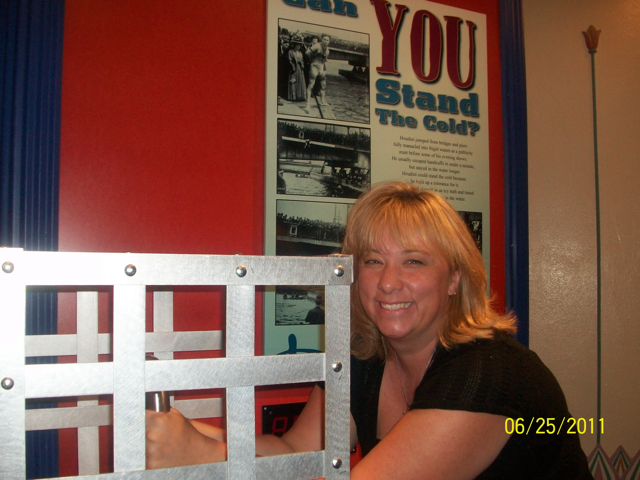 How long could I stand the cold that Houdini did? The other two floors of the museum were dedicated to sports through time in Appleton and tools and how they have changed in Appleton. 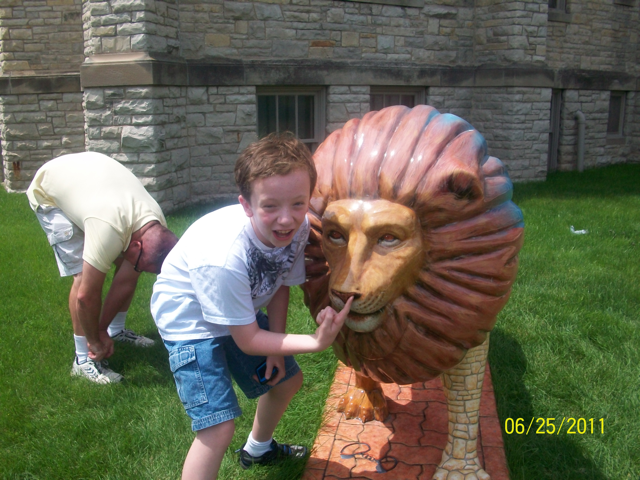 This was definitely worth the visit, and although it wasn't free, they did have a very reasonable family admission rate. 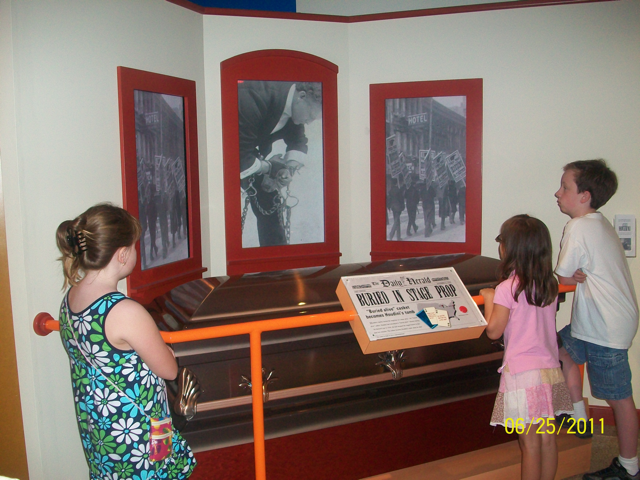 Learn more at The History Museum at the Castle, Appleton, WI. More photos are in the Photo Gallery.